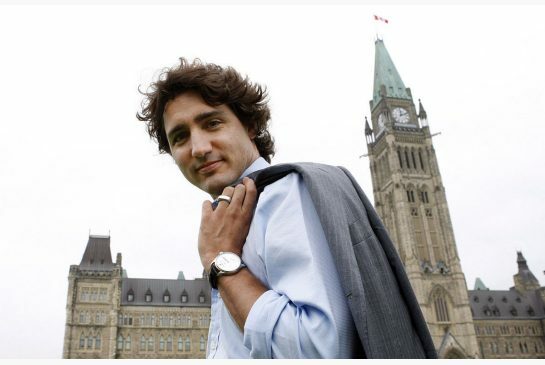 Justin Trudeau has been elected Prime Minister of Canada and will lead a majority government. His platform (program), his enthusiasm and his determination earned him a clear victory. Canada has a government whose priority will be the welfare of all Canadians. I will write further later, but couldn’t wait to tell you how very fortunate Canada is. 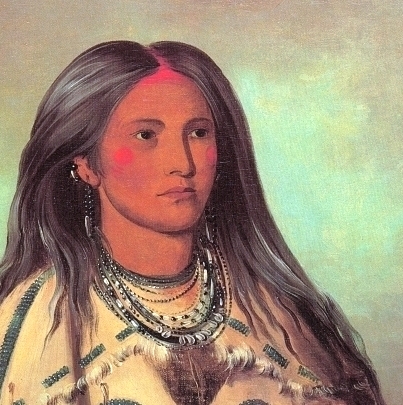 My post on the Ten Lost Tribes: Native Americans generated more interest than I expected. This theory dates back to James Adair‘s (c. 1709 – 1783) History of the Indians, in 1775, and it is supported by Israeli scholars. (See Ten Lost Tribes, Wikipedia.) However, their entering through the Bering Strait during the last glacial period is not the only account of the migration of Amerindians to the Americas. Another account, besides the Ten Lost Tribes, is Welsh prince Madog or Madoc‘s story. 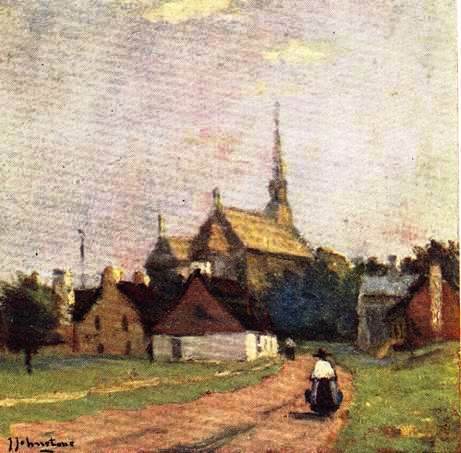 There is a tradition of a “white Indian” settlement at Louisville, Ky., and several 17th- and 18th-century reports were published concerning encounters of frontiersmen with Welsh-speaking Indians. Most anthropologists reject the idea of pre-Columbian European contacts with American Indians, but the evidence is not conclusive. The story is the basis of the epic poem Madoc (1805) by the English poet Robert Southey. In his 1584 Historie of Cambria, David Powel reported that, dissatisfied with the quarrels that divided his family, Welsh Prince Madoc ab Owain Gwynedd, one of the numerous sons of King Owain Gwynedd, and his brother Rhirid, tried to create a settlement in North America. On board their ships were 100 settlers: men, women, and children, who disembarked. The brothers sailed back to Wales to recruit more settlers, but the second group of Welsh colonists ported in Mexico. As for Madoc and Rhirid, they never returned to Wales, nor did they visit their North American colony. We do not know where Madoc’s North American colonists ported, but they intermarried and it is claimed that they are the ancestors of the Mandan tribe, Plains Amerindians who lived on the banks of the Missouri River and its tributaries and spoke a Siouan language, and if their encounters with Welsh-speaking colonists are not imaginary, some may also have spoken Welsh. Pierre Gaultier de Varennes, sieur de La Vérendrye (17 November 1685 – 5 December 1749), known as La Vérendrye, named the Mandans. He had heard Mantannes. The cart pulled by dogs or horses used by Plains Amerindians, is called a travois, from the French travail FR. 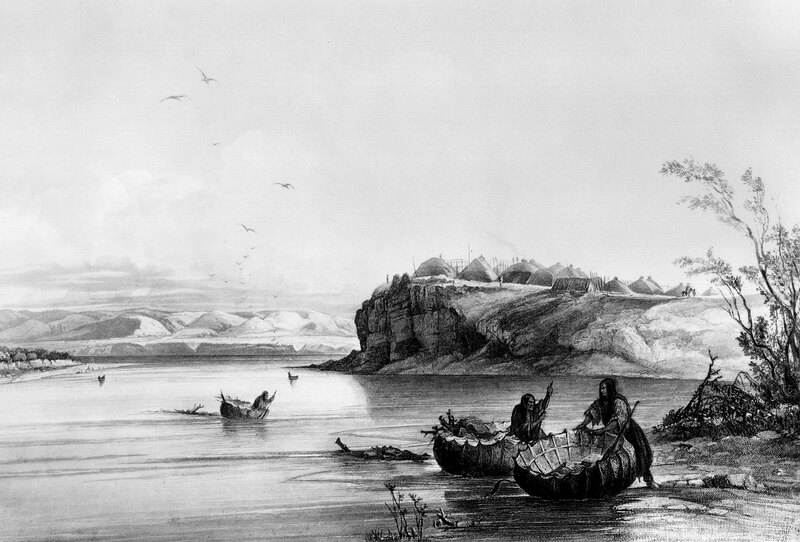 La Vérendrye and his four sons opened the territory west of Lake Superior. Two of his sons reached the Rocky Mountains. 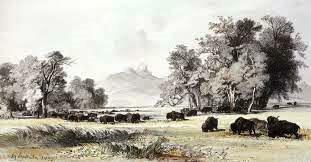 The Mandans were farmers and therefore sedentary, but the “buffalo,” or bison, was central to their survival, as it was to all Plains Amerindians. Its destruction by the white led to famine. In fact, it was genocidal. 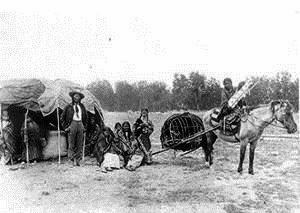 The bison provided meat, clothing, teepees (tents) and other essentials of life. Four million buffaloes were killed in Canada and Amerindians participated in the mass slaughter of their very livelihood. I suspect they acted out of fear. (See The Buffalo Slaughter in a People’s History, Canadian Broadcasting Corporation). King Philip‘s fear that Amerindians would lose the land that fed them was in no way imaginary. John Wadsworth Longfellow made famine the demise of Hiawatha‘s people, which was fictional but not imaginary. Yet, their skin colour was lighter than that of other American aboriginals, which is not obvious in the art of Catlin and Bodmer. Their features, however, could be European. It has therefore been speculated that they were of European origin, just as Cherokees would be the descendants of the Ten Lost Tribes. Interest in matters exotic and disappearing aboriginals is one of the characteristics of 19th-century scholarship, literature, and the fine arts. It may have led Prince Maximilian of Wied-Neuwied to study the manners, customs, and language of the Mandan tribe. For instance, prince Maximilian looked for possible similarities between Welsh and the Siouan language of the Mandans. 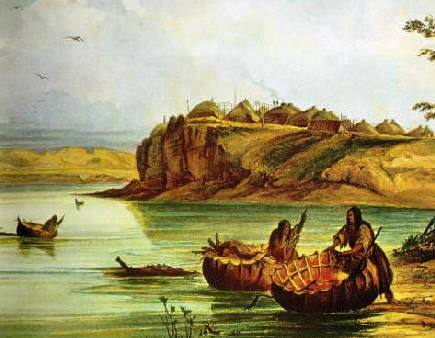 In 1832, Prince Maximilian of Wied-Neuwied and 23-year-old artist Karl Bodmer, also known as Jean-Charles Bodmer, went up the Missouri River and visited the Mandans and other Native Americans. 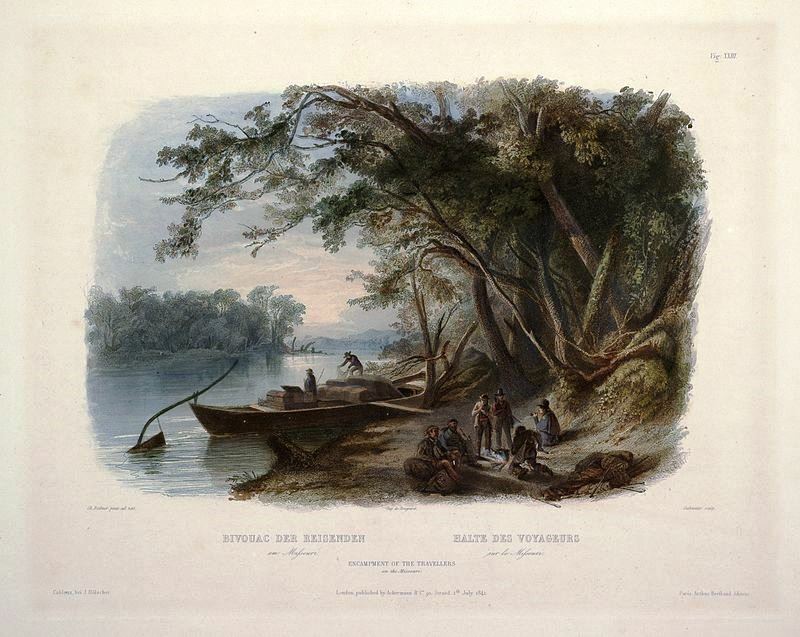 In 1840, Prince Maximilian published his Travels in the Interior of North America during the years 1832-1834 (Reise in das Innere Nord-Amerikas, 1840). 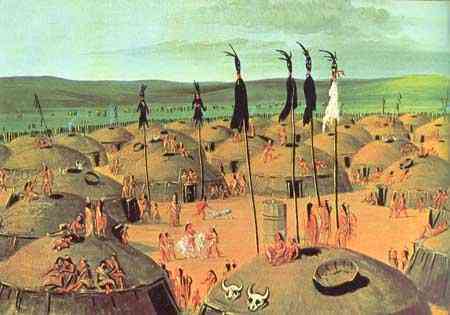 Prince Maximilian’s account of his travels, illustrated by Karl Bodmer, and George Catlin’s paintings may well constitute the only remains of the Mandan tribe, some of whom may have been of Welsh descent. According to the Census of 2010, there are very few Mandans left, a mere 365 full-bloods and 806 of partial Mandan ancestry. It would be unrealistic to assume that all Native Americans entered the Americas from the Beringia Land Bridge. Diversity among Amerindians precludes a single point of origin. In all likelihood people crossed the Atlantic Ocean from the moment there was an Atlantic Ocean to cross. This is what human beings have always done. Europeans were fishing off the coast of Newfoundland in the 1200s. “Madog Ab Owain Gwynedd”. Encyclopædia Britannica. Encyclopædia Britannica Online. The “West Wind” is a major character in The Song of Hiawatha. It is Mudjekeewis, Hiawatha’s father, presuming he has a father. 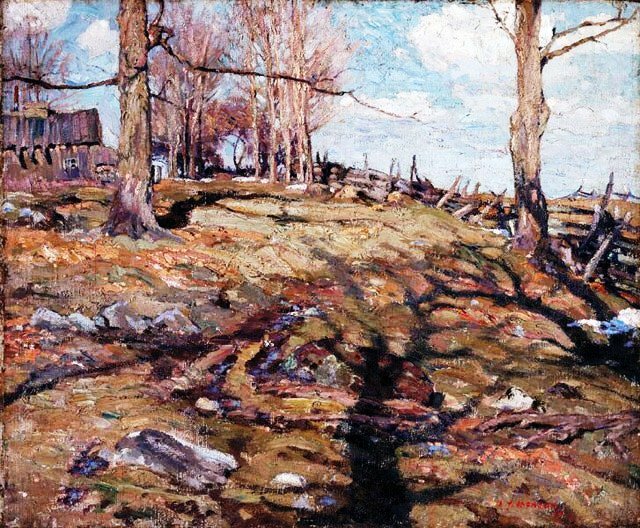 In April 2012, I published a post featuring Tom Thomson‘s “West Wind” (1917). 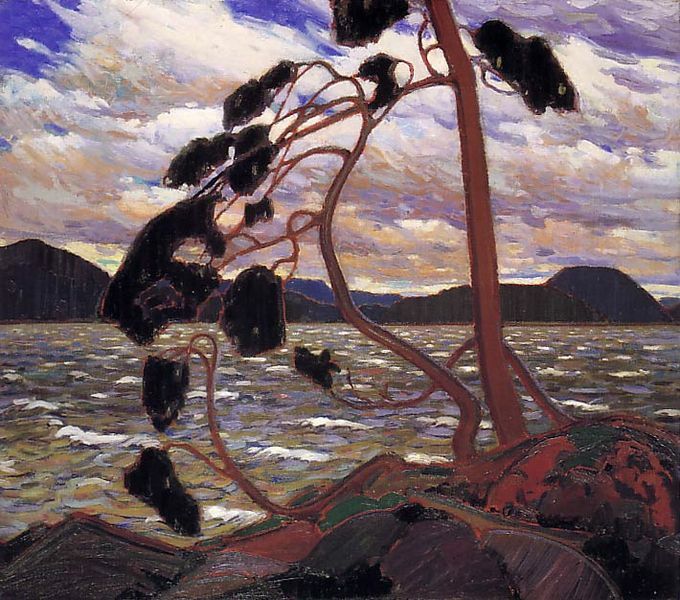 The “West Wind” is also a major character in the art of Tom Thomson (5 August 1877 – 8 July 1977). I sense similarities. 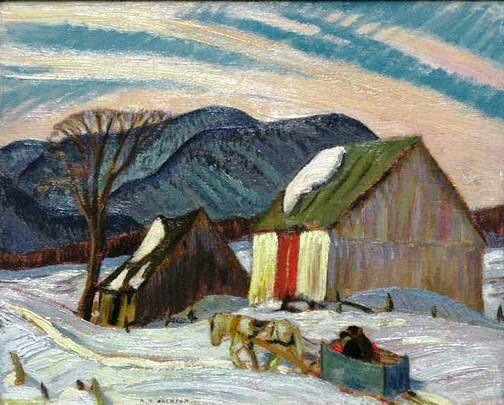 Thomson died before the Group of Seven was formed. 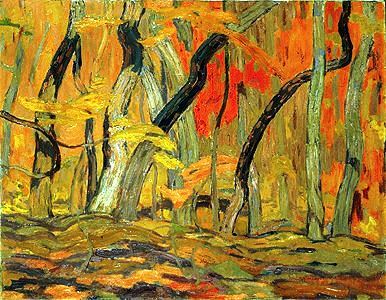 However, given the subject matter of his paintings, his style as an artist, not to mention his lifestyle, that of a woodsman, he is considered as a precursor to members of the Group of Seven, arguably Canada’s most renowned group of artists. However, his lifestyle and the very title of the painting featured above also suggest cultural kinship with the Amerindians of the Central Woodland, thus identified by Stith Thompson. 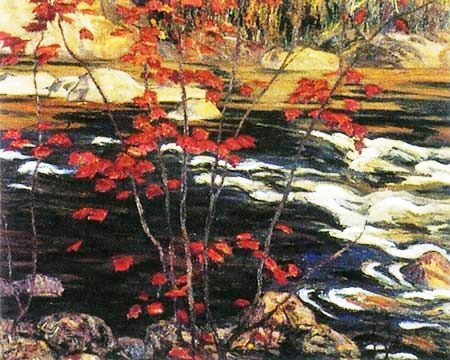 Tom Thomson settled in Algonquin Park in 1914, where he worked as a firefighter and guide, but lived in a cabin, devoting most of his time to his art. Thomson died during a canoeing trip. He was only 39. His premature death has served to transform him into a legend. The legend, however, is his art. Testimonials to a virgin past about to be destroyed for profit are numerous. Climate protected the Central Woodland. It was cold and therefore uninviting to loggers. But ‘improved’ harvesting technologies won the day. The Arctic is melting down. There’s land left, but too much was harvested in a way that could not allow regrowth. It was harvested in the name of profit, and the prospect of profit numbs reason. Humans kill. They kill in the name of profit. They also kill in the name of God. They kill. Manabozho created land and whatever land had been lost to a flood, he created again. Such was his godliness. Stith Thompson, The Folktale (Berkeley, Los Angeles, London: University of California Press, 1977 ), pp. 306-307. 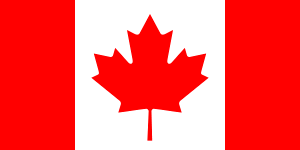 My next post is about the controversial language laws passed in the Province of Quebec in the 1970s: Bill 22, the Official Language Act, Quebec (1974), and Bill 101, or Charter of the French Language (1977). However, it would be useful to know how many citizens spoke French in the years that followed what many Quebecers still call the “conquest” until the last census. This information takes us to and beyond the Official Languages Act (Canada), which recognized Canada as an officially bilingual country. The Official Languages Act became effective on 9 September 1969. England could have reneged on its promises, but its Thirteen Colonies, running down the east coast of the current United States, were threatening to become independent of their motherland, Britain. The Declaration of Independence was promulgated on 4 July 1776 and, in 1783, the Thirteen Colonies won the American Revolutionary War, with the support of France. 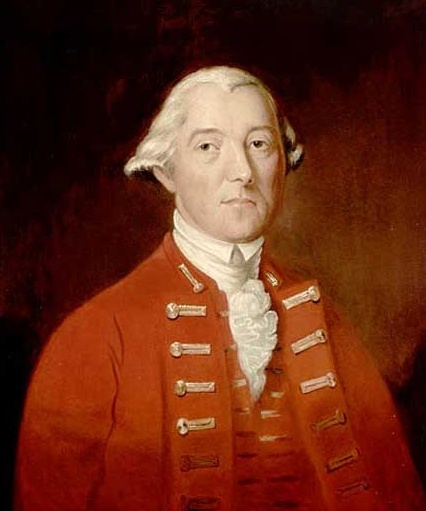 Guy Carleton, 1st baron Dorchester KB, may have felt Britain could need the help of Quebecers and their Amerindian allies in order to fight rebellious “Americans.” This could be the case, but the status the “Quebec Act” gave French-speaking Canadians tends to outweigh other considerations. Moreover, the Act was unsolicited. 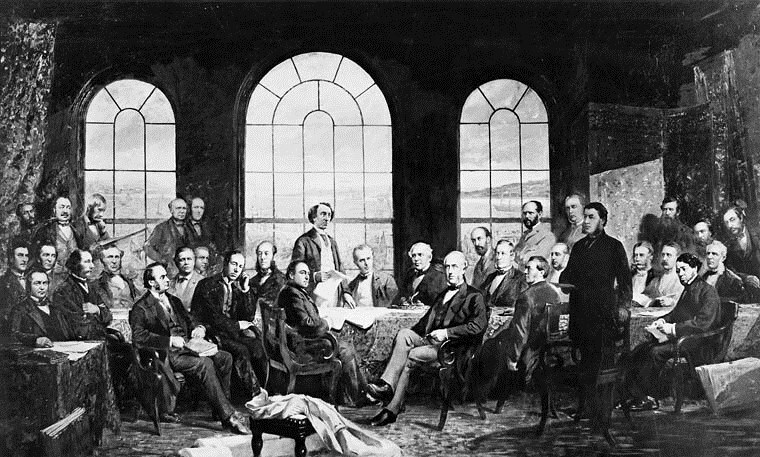 Quebec was one of the four provinces that entered into the Canadian Confederation in 1867. It did so under the leadership of Sir George-Étienne Cartier, PC. 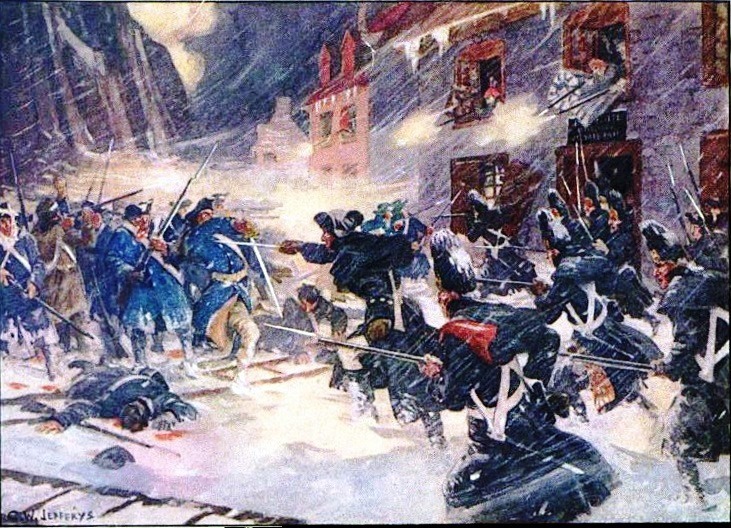 It would be my opinion that the Quebec Act of 1774 probably ensured the survival of French in Canada. 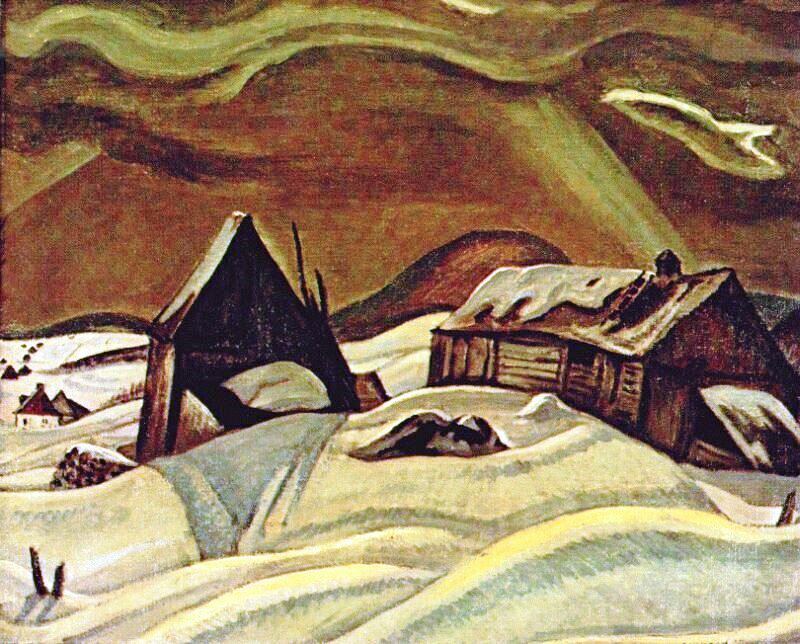 As noted above, we owe the “Quebec Act” to Guy Carleton, 1st baron Dorchester KB. It was an act of the Parliament of Great Britain, which replaced The Royal Proclamation of 1763, temporary governance. Until the Révolution tranquille, the 1960s, a very high birthrate, the revenge of the cradle(s) (la revanche des berceaux), and “colonisation,” settling north, also ensured the survival of French in Canada. 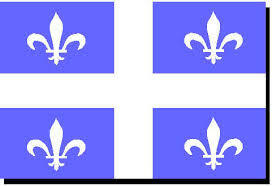 But it is unlikely that a vibrant French Canada would have developed had it not been for the “Quebec Act” of 1774. Foulds, Nancy Brown, “Quebec Act”, The Canadian Encyclopedia. Toronto: Historica Canada, 2013. Web. 13 August 2013. Un policier prend position devant le parlement où des coups de feu ont été échangés. 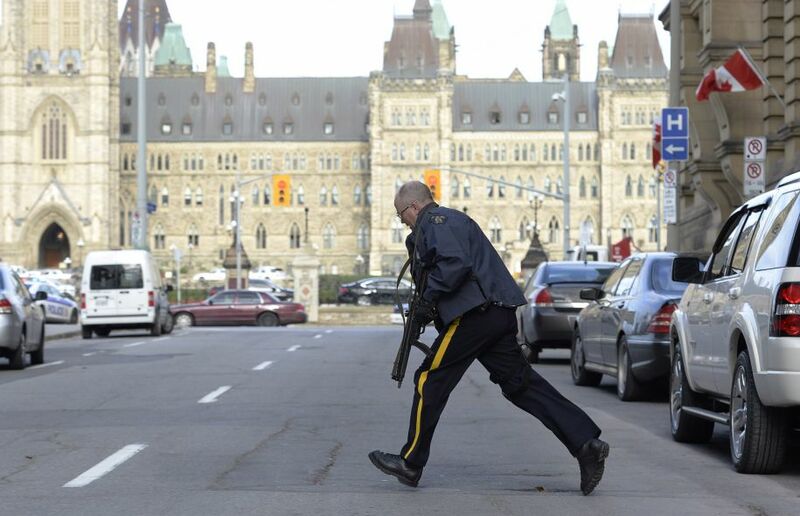 I just picked up the local newspaper and read that, yesterday, a soldier was killed in Ottawa. I have yet to read all fourteen pages devoted to the killing by a would-be terrorist, in Ottawa, Canada’s capital. 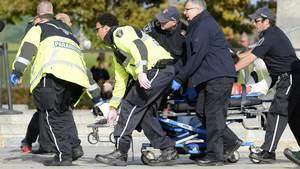 The above picture was copied from Le Devoir, the leading French-language paper in Canada.terrorist, in Canada’s capital. The above picture was copied from Le Devoir, the leading French-language paper in Canada. The suspected killer has been identified as Montreal-born Michael Zehaf-Bibeau, aged 32. The victim was Nathan Frank Cirillo, aged 24. Michael Zehaf-Bibeau was shot by sergeant Kevin Vickers. Two individuals were injured. I watch the News at suppertime, but yesterday I had flu symptoms and a temperature. I walked in front of the television set without turning it on. At least one French-Canadian, from Sherbrooke, where I live, has joined Isis. He has been reported missing and may have been killed. An inquiry is under way. Needless to say Canada’s Muslim population fears retaliation, but they are not to blame. The above is the reason why I am trusting President Obama. He is in possession of facts denied civilians for security reasons. I understand why President Obama has a friendly relationship with former President George W. Bush. The attacks of 11 September 2001 could cause undue haste. Allow me to read the details and get back to you.